Althorp Literary Festival, celebrating its 10th year, had an impressive line-up of authors. Having to choose a day to visit was extremely difficult, but with Ken Dodd topping the bill on the first day I didn’t need much persuasion. It was a day beginning with a mixture of pathos and the horrors of war, which brought an emotional reading from Paddy Ashdown, and ending with our top jester who brought us to tears of a different kind. Paddy Ashdown’s reading from his A Brilliant Little Operation – the story of the ‘Cockleshell’ raid in 1942 – including some of the fascinating and often tragic facts discovered during his research made a moving, informative and sometimes funny session extremely enjoyable. As an ex SBS man he looks and sounds the former soldier, which he admits helped him to enter the mindset of his protagonists, though he said his own experiences were ‘a walk in the park’ compared to the hell that the Cockshell Heroes suffered. While waiting to hear Sandi Toksvig, she of the News Quiz fame, I was treated to, or rather overheard, Ann Widdecombe in full flow. I didn’t need to sit in the packed marquee or even stand outside. Her voice cut through the quiet of the Northants countryside like a saw. To describe her in the programme as ‘intrepid and engaging’ was an understatement! Well done Ann. Sandi stocks up with more copies for signing. Sandi Toksvig being interviewed about her novel Valentine Grey proved to be equally engaging and a contrast to Paddy Ashdown’s session. Her early comment about working with an all male film crew for long periods: ‘as long as they have a bacon sandwich and they’ve been to the toilet they’re fine’ set the tone for the afternoon. The marquee was packed as she explained her research and writing behind this very moving story. For anyone who knew little or nothing about the horrific Boer War this was an eye-opener, as well as a stomach churner. Interspersed with humorous anecdotes and ad-libs the session was over all too quickly. The penultimate event was The Art of Being Idle hosted by Tom Hodgkinson and Sir Timothy Ackroyd. Despite the slight quirkiness of the subject, How to be Idle and the deliberations of some of his ‘philosophers of leisure’, Hodgkinson got me thinking that maybe there was something to consider and even value in a life of sloth. While I enjoyed his attempts to resurrect Harry McClintock’s ‘Big Rock Candy Mountain’, accompanying himself on a ukulele, it left me wondering what happened to the original catchy refrain! Ken signs programmes for a host of admirers. 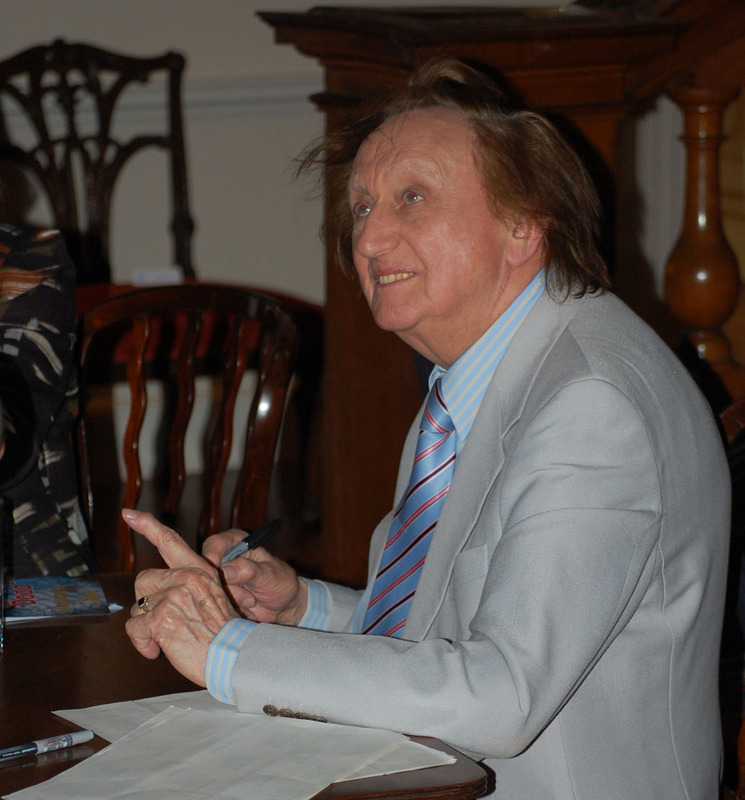 To round off the day there was only one place to be – listening to Fiona Lindsay trying (and for the most part succeeding) to interview Ken Dodd. Though he is beginning to look his age (86) there’s something magical that comes over him the minute he starts to perform. He transforms into a younger, livelier jester – an absolute joy to watch, listen to and be with. Like many of the audience I came away asking why he hasn’t been more highly honoured for what is an outstanding contribution to comedy. But then I was still crying with laughter.